Our client is a leading logistics company offering innovative logistics solutions to transporters and clients alike. They seek to hire a competent and well organised Executive Assistant to provide high level support to the Managing Director. · Follow up with key contributors to the MD’s projects and maintain the timeline around deliverables, keeping the projects on task. 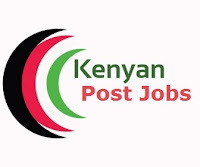 Please only send your CV quoting the job title in the email subject (Executive Assistant – Logistics) to jobs@corporatestaffing.co.ke before Monday 1st April 2019. Only candidates shortlisted for interview will be contacted.